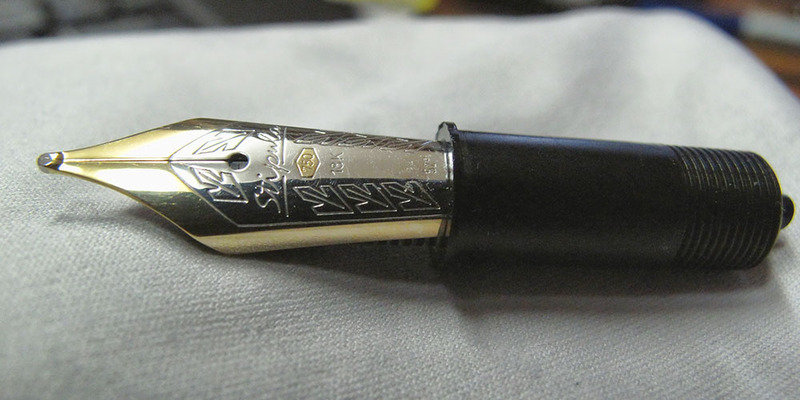 I got questions about the large Stipula 52 degree nib in several places, all related to the FPN LE Pens , and I'd thought I share the answers and pictures here, for those interested. 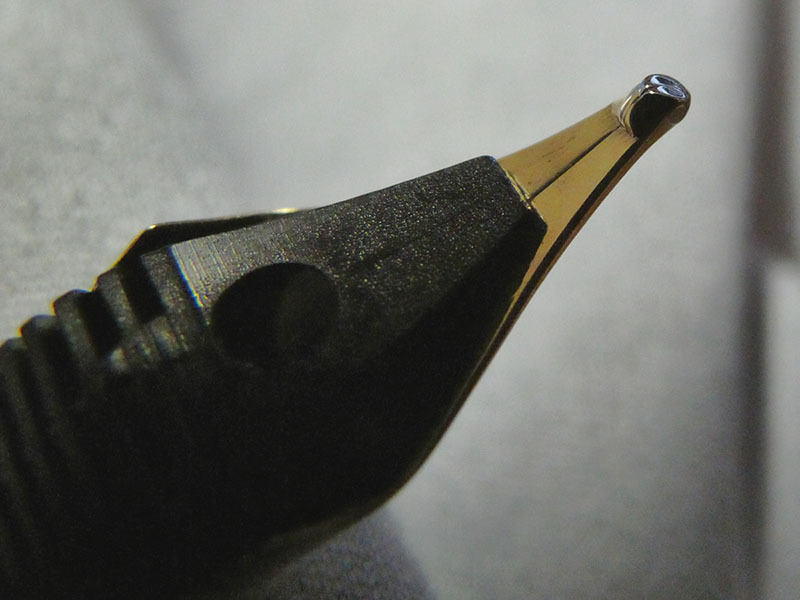 The Stipula 52 degree nib is essentially what other manufacturers call a zoom nib, a very wide tipped nib with a narrow front, widening towards the back to the maximum width, and then slightly tapering off again, just more quickly. For simplicity. imagine a triangle, with the sharp top of the triangle being at the front of the nib, and the base at the back end of the nib. 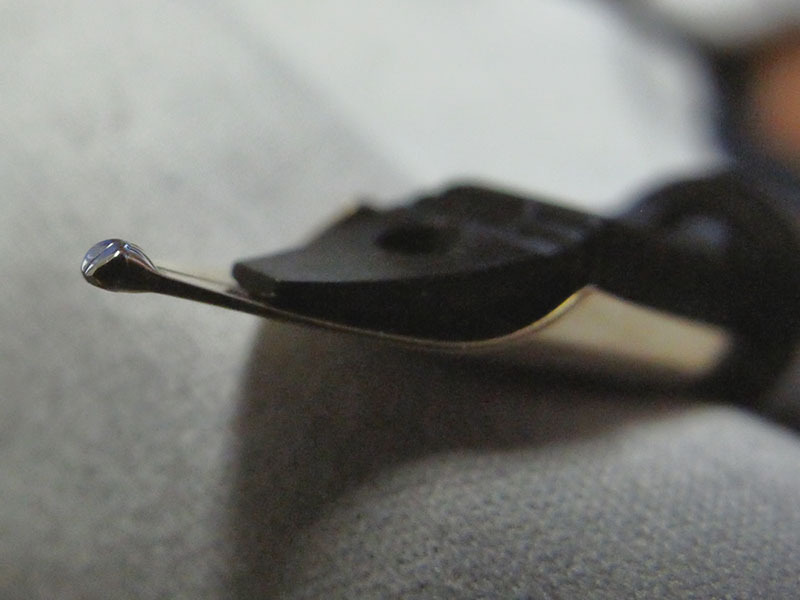 In practice it is more of a drop shape, thin part at the front, wider part at the back. It is also flattened (be it well rounded at the edges), so, that at an angle of 52 degrees (approximately) to the paper, most of the tipping is in contact with the paper, and if you write normally, that is what will stay in contact with the paper more or less, resulting in a 2B to 3B line. 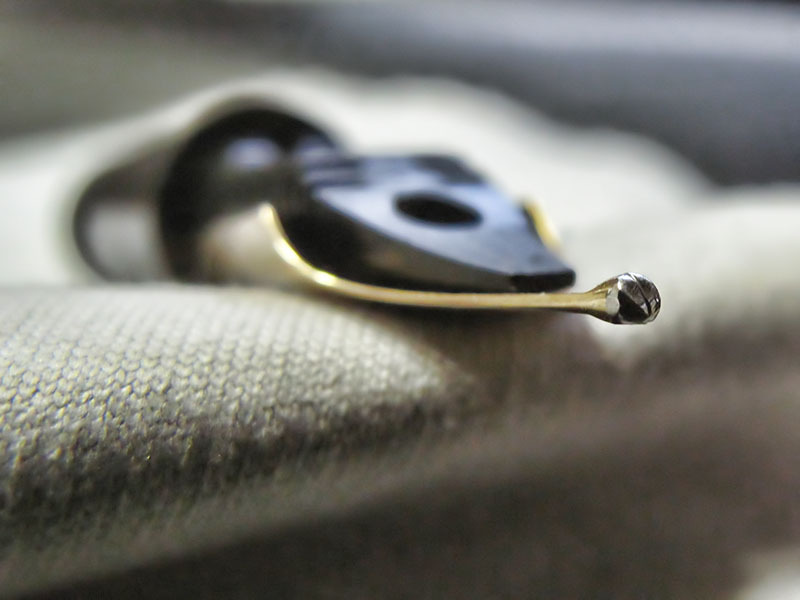 However, make the angle smaller, and the bottom part of the "drop" gets in contact with the paper, which of course narrows quickly, in a nice and rounded fashion. Make the angle larger, and the narrower part comes into contact with the paper, obviously narrowing the line. Now imagine drawing with a brush. For a line you start relatively high, IOW, at a fairly small angle to the paper, you draw going downwards, thus increasing the angle, until you draw further down to finish a stroke, where the angle increases even more, until the brush leaves the paper again. IOW, doing this with a zoom nib, you start with a roughly rounded line, which grows thicker very quickly moving down, and narrowing increasingly when moving further down, as if you have used a brush. If you do write like a Westerner, however, you'll generally find it is a very smooth ~2B/3B, with some line variation vertically, not horizontally. If you write with it as a brush, it provides a lot of brushlike variation, obviously. This is why it is currently especially popular in Japan, I have been told.by the friendly folk of Etruria s.r.l. (the company we call Stipula, but that is their pen brand name, really). Some pics follow, slightly noisy because taken at iso 800 and with a compact, but they are quite adequate think . 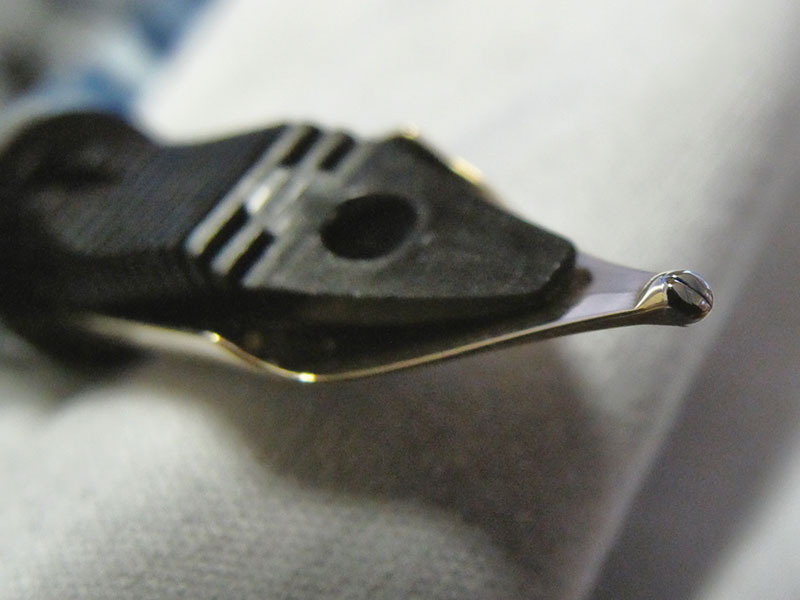 1) Entire nib assembly, and no, it is not bent. That is caused by lighting and because at its nearest macro distance the lens is at the wide angle setting. 2) From the side, showing both the triangular area I was talking about, and the roundedness of the tipping, for writing at different angles. 3) Side view from down under . 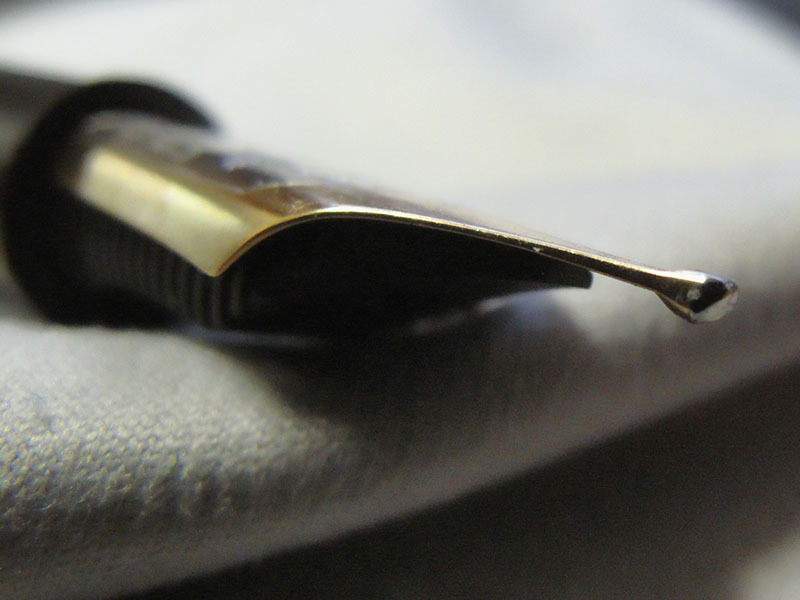 4) As 3, but closer to the nib slit. 5) From above, to show lateral roundness as well IOW, very forgiving). 6) The area that is in contact with the paper at 52 degrees can be seen very clearly in this photograph - that area is HHHUUUGGGEEE . 7) The 52 degree contact area straight up ahead. 8) Side view showing the areas in contact with the paper better when at an angle less than 52 degrees. 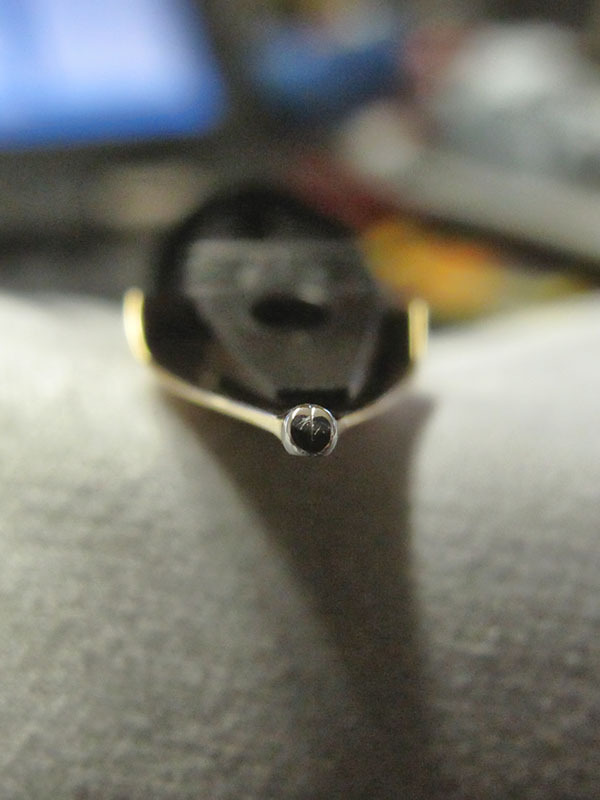 9) Another side view, which also shows the part of the tip a little better which is in contact with the paper at angles larger than 52 degrees. so do we get to See what this serious-major nib does? Wim, thanks so much for explaining this and for the pictures. I'm one of those who has wondered about it a great deal. Of course, now I want to try one. Santa, are you listening? Can't wait until mine gets here. This is going to be FUN! Now we only need a writing sample. 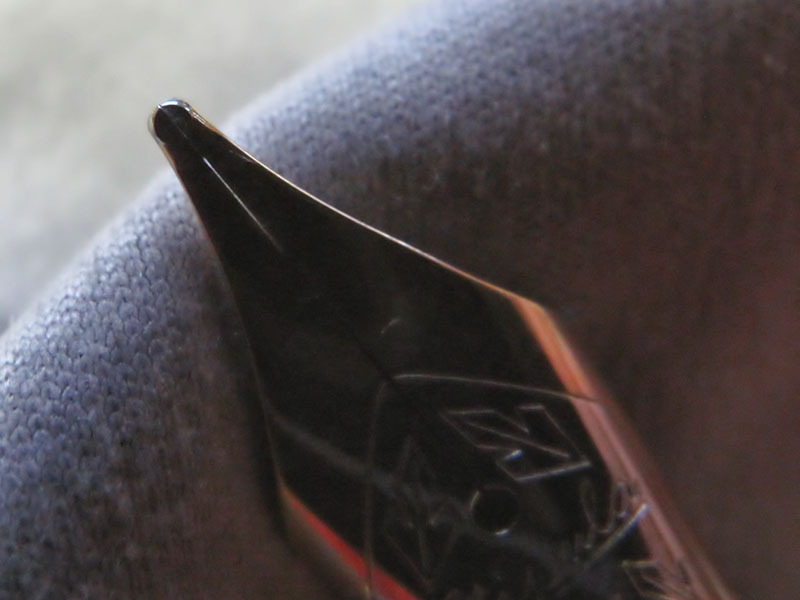 being such a uniquely shaped nib, won't it get used less frequently? Edited by TMLee, 10 November 2011 - 01:53. 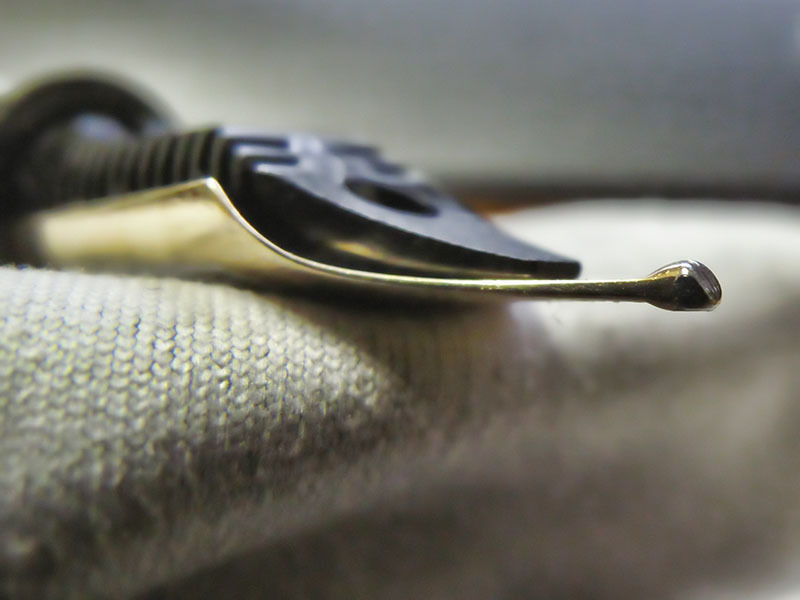 That looks like a really sweet nib! Might have to figure out how to get one of those! Thanks for posting pics, I was wondering what it looked like. I was thinking more like an oblique-ish stub, and it's totally different from that! Thanks for the photos and the explanation wimg. Very interesting, I'd like to try out that nib.